Monsieur and I had seen how dense Hanoi traffic was and we’d had a brief lesson on how to cross the road from the caring concierge at the Metropole Hotel. Now we just had to do it. Easier said than done. You see, the traffic just keeps coming. It doesn’t stop or slow; it swerves to miss hitting you. As for pedestrian crossings, they exist but are mere suggestions. Sometimes the traffic will stop at a red light, but from what we could see there’s no guarantee. After a fortnight in Vietnam, we would be experts at street crossing, but for now we just had to do it once without becoming Vietnamese road kill. In spite of the concierge’s encouraging words about using corners where possible to cross and following a local human shield, it’s not for the faint-hearted to take that first step into the road and trust that the last thing on any motorcyclist’s mind is wiping bits of dead tourist off his front wheel. That first day in Hanoi, Monsieur and I waited at a corner near the hotel. We watched for the break in the traffic that never came. Finally, heart in mouth and with a quick prayer launched skyward, we left the kerb and kept going. “Don’t hesitate,” the concierge had told us, “it’s dangerous to hesitate. Once you start walking, don’t stop until you get to the other side.” We heeded his words and obviously lived to tell the tale, but upon my word, it was terrifying . Crossing the road Vietnam-style goes against everything you’re taught when small. Look left, look right, look around. Forget it all. Don’t look at anything, just walk and have faith in your fellow human beings not to squish you. As we walked, the traffic swooped around us, not slowing, but buzzing as it passed on by. On the other side of the road, I realised I’d held my breath. Heart racing, I opened my mouth and swallowed lots of humid Hanoi air. As with learning many new skills, the first time is often the hardest. This was the case with street crossing in Vietnam. We quickly learned to shadow the locals who were crossing the same roads and mimicked them, walking steadily without stopping, trusting everyone on wheels to miss us. Looking back, I’ve had more serious near-misses with mopeds in Naples, but Naples was not on my mind in Vietnam. So if you ever find yourself in Vietnam, you will have to re-learn your road-crossing rules. Do as we did and you’ll be fine. Take a local human shield where possible, walk steadily and straight and do not stop. With a bit of luck you will reach the other side. Again and again and again. I had to laugh when I read this post. Anyone who goes to Hanoi for the first time is in for a shock when it comes to crossing the road and the advice you offer is spot on. My wife and I went through the same thing when we were there. I certainly wouldn’t recommend this technique in Italy though! That is true! When I was in Ho Chi Minh, I will quickly look if there is any locals wanting to cross the road then I followed, if not, I just trust that the bikes won’t run me over. Though my brother was always hesitant and resulting in our driver (a very nice guy name Tuan) that will stop or direct traffic at the road so my brother can cross safely. Razz – my sentiments exactly. On my first ever holiday with Monsieur I was very, very nearly squished by a moped. Crossing the road there needs a different set of rules again. Dils – sounds like your driver was a good man, indeed. I wish we’d had a Tuan for those first couple of days in Hanoi! yes, the drivers of anything with 2 wheels in Hanoi are pretty skilled. 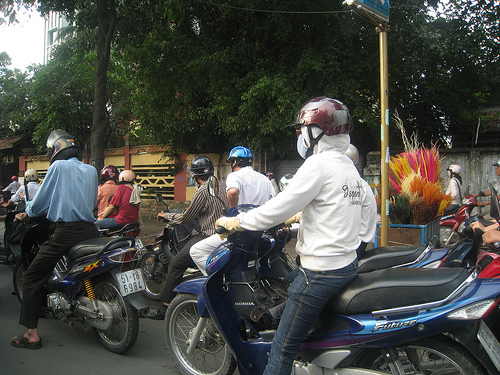 We once took a motorcycle tour of Saigon which was terrifying to begin with, but after a while you get used to being in the traffic and it makes you feel a lot safer when crossing the road on 2 feet!